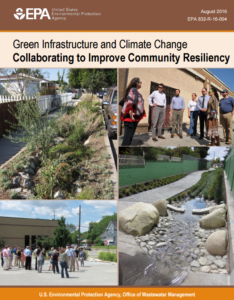 As different parts of the country become drier, wetter or hotter, community leaders and citizens are looking to green infrastructure to improve their community’s resiliency to the effects of climate change. In 2015, EPA convened charrettes, or intensive planning sessions, in four cities to demonstrate how this type of planning could be applied to communities dealing with a range of challenges. Each city’s charrette focused on different issues based on the most pressing climate change impacts they were facing and their current level of green infrastructure implementation. In each city, participants were selected from a variety of disciplines, including city decision makers, climate scientists, water resource specialists, city planners, and neighborhood and environmental groups, among others.